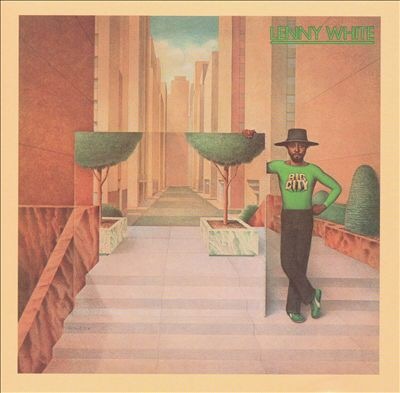 I learned about Lenny White from his drumming with Return To Forever (RTF). RTF was one of the great fusion bands of the 70s where every member of the band was a virtuoso. I don’t know the story of this album, but it is a hodgepodge. The LP opens with the titular track where Lenny joins forces with Brian Auger’s Oblivion Express and the Tower Of Power horns. As you might expect it is badass jazz rock with a twist of funk. The next is a soul jazz ballad featuring vocalist Linda Tillery and pianist Herbie Hancock. “Sweet Dreamer” is pretty anonymous, except for the Hancock keys. Lenny juxtapositions the ballad with two disjointed “Interludes.” The first is a minute jam between Lenny and bassist Marcus Miller. The second a minute and half of an orchestra. Lenny takes another hard turn on extended jam between Lenny, Herbie Hancock and Ray Gomaz (on guitar). “Rapid Transit” Is a punk-jazz jam. This song would have sounded perfectly fine after the first cut. Side one ends with drum solo (“Ritmo Loco”) and an uncredited heavy guitar riff for a couple of bars. Side two starts out with “Dreams Come And Go Away” a literal definition of jazz rock fusion. Heavy guitars from Journey’s Neal Schon and jazz piano from Onaje Allan Gumbs. White then presents the ambitious “Enchanted Pool Suite.” A RTF-like composition featuring Mahavishnu Orchestra’s Jerry Goodman (violin) and Jan Hammer. The album ends with a live cut featuring Brian Auger and the dueling guitars of Neal Schon (left channel) and Ray Gomez (right channel). A dash of sax from from Bernie Maupin spices things up. Although this is a disjointed album, the individual cuts are worth the price of admission. The best cuts are on the rock side of the fusion spectrum. This album must have a following amongst collectors: used CDs are $100 and quality vinyl is in the $25 range. I picked up a decent vinyl copy for $4. I just wish the album had a little more continuity to it. It reminds me of another fusion drummer’s brilliant mess – Tony Williams The Joy Of Flying from about the same era. The album is not on Spotify, so start digging.